Just popping in to share some pictures from this morning. 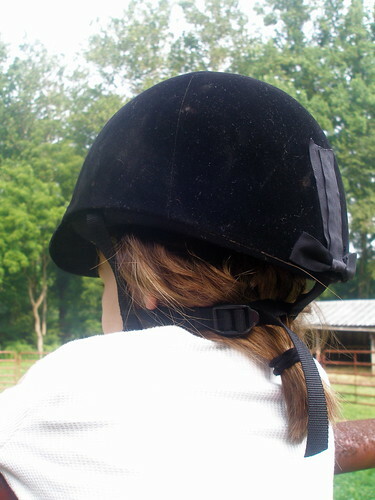 I took Emma over to the barn to get a little practice in before tomorrow–her first horse show. She is showing at the county 4-H Fair in lead line classes. My little sister will be bringing her pony and taking Emma through the events. Emma is excited and admittedly nervous. But the prospect of show clothes and ribbons has her grinning from ear to ear. Mary, of course, got a ride in as well–always dressed for the occasion in her pink cowgirl boots and ruffled skirt. It’s also ninety-plus degrees and humidity is hanging in the air like a damp towel–but she’s in a long-sleeved, long underwear top. I’ve given up my fight with this child. The long sleeves were a compromise. I talked her down from jeans and a fleece zip-up hoodie. I just have to let her sweat it out, until she agrees to take off one of her many layers. My littlest sidekick learned the joy of climbing gates and finding a comfortable seat. 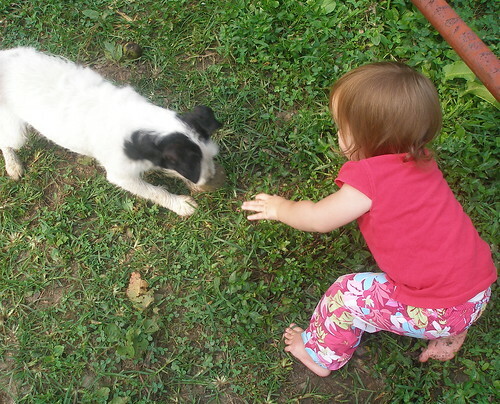 And she became best pals with a persistent little farm dog–rolling a gritty brown tennis ball back and forth until she tired of the game. On the way home she fell asleep in the car. The road to the farm is one of my favorites around here–the majority of it is not paved and it winds along a beautiful, clear creek. When Elizabeth was a little babe and I needed to get out of the house for a break, the girls and I would often pile in the car and drive this road so I could catch my breath in the world of mother-to-three. The vibration of the stones under our tires, the flickering of sun and shade through her window, always seemed to lull her to sleep. I watched her in my rear view mirror today while I drove. Her eyes were always out her side window, looking up into the treetops. When I looked back the last time, she was sound asleep. My sweet little babe. Someone does some great weed-eating at your farm, wow! Ours looks much more ragamuffin this time of year. I love the little noggin in the huge riding helmet and the gate-sitting. Here’s hoping it’s less humid and hazy tomorrow. Yeah, my little one wanted to play outside (it’s 100 today) and I said no because it was too hot. He offered to put on a jacket. I countered with waiting til sunset. Our resident horse lover had her first horse show over Fourth of July weekend. She also is in the lead line class and was plenty nervous before the show but after her first words were “I want to do that again!” She is hooked! May yours enjoy her showing experience just as much! I know that eastern haze…but I miss it anyway! So beautiful. *sigh* That last photo is something out of my dreams. I hope to one day be living somewhere with the beauty of country calmness. i’m grinning ear to ear.it’s all just so good. 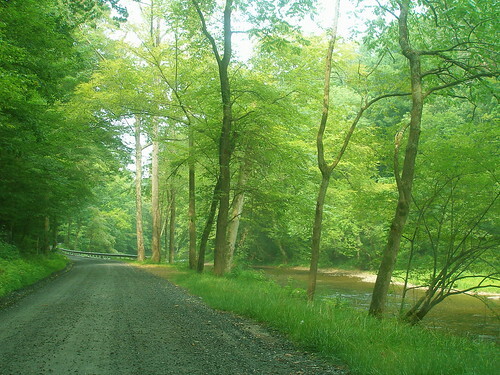 Those photos are beautiful-they remind me of the scenes I saw this weekend on my mini-road trip! 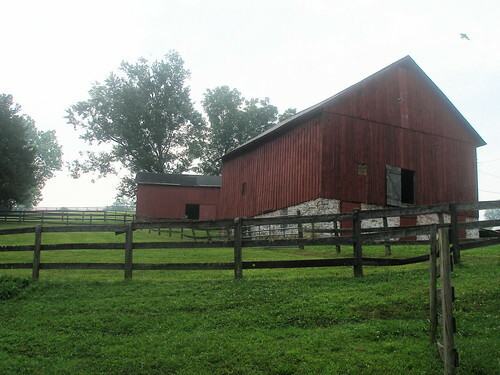 I just love old, red barns! What beautiful country side. And how exciting for your wee girl, I used to ride horses when I was young and went to the odd show, what fun. That photo of the farm doesn’t even look real, it’s like a movie set or something. So beautiful. My son did his first horse show last summer. Lead line was a wonderful thing – all of them got first place ribbons! Our show has a costume class too. Also a lot of fun. you are wonderful. i found you through marytree. The drive along that road looks divine. I have a drive-to-napper/sleeper also. Not quite the time for it at $4.27/gallon but whatever works, right?! Where you live is so beautiful. What a beautiful drive – so refreshing and I can imagine it would offer much good for the ‘soul’. As would your little one asleep. I never get tired of peeking in on my sleeping children. Hope your daughter does well with her horse show. What beautiful pictures! My son likes to wear long pants all year long – even in our hot and humid Florida summers. I gave up suggesting shorts. If he gets hot, he can always change. 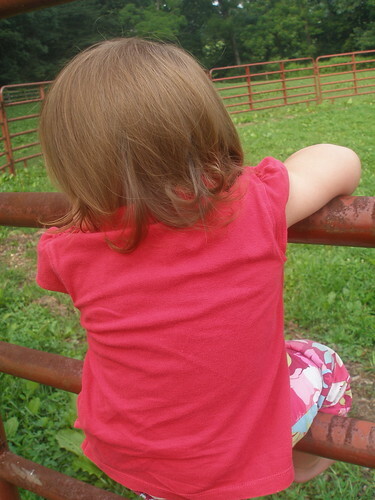 My P will put on long sleeves all year long too..not really comfortable in NJ in summer.Beautiful pictures…so serene. 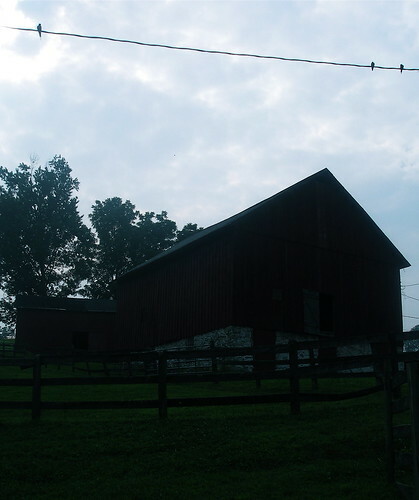 I’m writing posts about the farm we visited recently. There’s something so lovely and fun about living on a farm. Yours looks beautiful and what a great opportunity that your girls can ride horses. Such a blessing. Hope the show goes well! Hi, Molly, Mary here again. I loved your farm photos so much, I linked you in my last post. She did so well. She was so composed and very grown up! I love these photos. You are living my dream– o soon to live on a farm. I just stumbled upon your beautiful blog, what great photos! 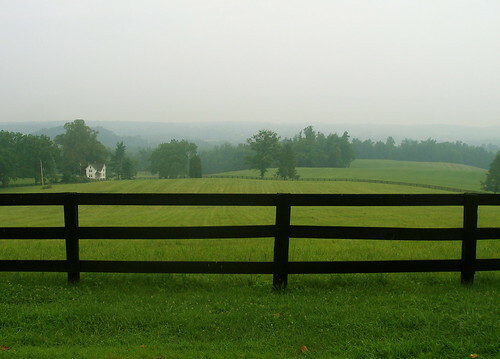 I just found your blog this morning and was treated to your gorgeous country road farm pictures. Wow. Just what a suburban girl like me needed to see today…some peace. Thank you for sharing. Your blog is beautiful! I loved these photos and wanted to let you know I linked up to your post in my blog today here http://cozyliving.typepad.com/cozyliving/2008/08/a-tarantula-cro.htmlThank you for sharing. Beautiful pictures Molly! Haven’t been on the computer in awhile so I’m catching up on everything you guys have been up to. Your new home looks so great…I am sure you are just loving having your own space. I’m happy for you! And happy birthday…..hope it was wonderful! ok. you’ve tempted me thoroughly. when can i come paint the view from that road!? Anybody with any sense dreams of living someplace like this. You are blessed. Molly, Jeremy showed me your blog last night. I am in awe of the beautiful pictures and wonderful stories that you have shared. Thank you for being so real!